1. used for finishing the surface of precious metals, chrome-cobalt-nickel alloys. 2. removing the burrs of the castings, forgings and the welding spatter on the weld assemblies. 3. chamfering or burring the pipes. 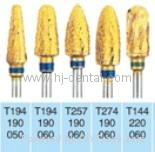 4. chamfering angle, circular bead or flute on the mechanical components. 5. polishing the impeller channel. 6. grinding the hole to an accurate shape. 1. instead of small emery wheels, without powder pollution. 2. increasing productivity of several ten times than using hand tools and three to five times than using small emery wheels. 3. having long life of ten times than high speed steel burrs and fifty times than small emery wheels. 1. must wear protection cover when operating and cut. 2. extending cutter should be moderated when operating. 3. adop different speeds of level according to processing materials.